← Sorry, There are no Buns Left in this Oven. Check Down the Street. My Writing Process. But first, I Need to Flip the Laundry. I’ve been meaning to write this essay about how I write my essays. You know, the ‘process’. All writers have their own individual approach to writing. Some just sit down and bang it out. Some bang and then sit down and write. We all have our own way. No judgment. So I had the idea, but I couldn’t figure out how to best structure it. I mulled it over a bit, and then put it on the back burner. A few days later, I picked it back up and tossed it around. Then I did what I usually do at this point, which is, to continue dragging my feet, literally, and go for a run. Often, I come up with a lot of my ideas while running. With nothing but time to kill, it’s the perfect opportunity to brainstorm. So I plod along plotting my stories, constructing brilliant first lines and clever turns of phrase. When I mercifully stagger back to my door, I head straight for my dining room chair, aka my work seat, where, with sweat dripping on the keypad, I quickly get down my thoughts, before they are incinerated by my awesome calorie burn. After this initial burst, I go up for a shower, and let my ideas stew in the hot water for at least 10 solid steaming minutes. Back at the computer, the screen and I stare each other down. Where am I going with this idea? I wonder. Will this work? I write another sentence or two, then feel an overwhelming urge to check my emails. When I come up with nothing, I move on to Facebook and Twitter. Back to the essay. I re-read. Delete a line and rewrite. Add another line. I sit back and assess. It’s not bad. I feel the urge for a snack. No. I need to focus. Write another line. Hmm… should I get some frozen yogurt? Or maybe an apple with peanut butter? Focus! Soup? I can’t stand it. I’ll be right back. I go for chocolate and peanut butter yogurt with a medley of toppings. I’m making cones and dipping them as I type. I’m in such a happy, satisfied place. I write a few more lines. Oh, I’m in the groove now and knock out a whole paragraph. It’s good. Woo. I’m exhausted, I need a break. Go back and re-read what I’ve written. Decent open. Entertaining middle. Tweak. Tweak. Get up for more sprinkles. What? I need more sprinkles. It’s part of my process. Just a few more lines and I’m done. I’m antsy. I need to pee. I’m almost finished. So close. Tweak. Tweak. Twitter. I just need the right ending. Posted in Writing and tagged blogging, procrastination, writing, writing process. Bookmark the permalink. Haha that is so cool! It’s similar to how I work. I have a very scattered brain so I write while having a million other windows open on the screen. I chat with people on Facebook while writing etc. I have wondered many times why I can’t focus 100% for a set amount of time, is there something wrong with me? But I am beginning to learn that my brain works best when it is occupied by more than one thing. Nice to know I am not alone. Sounds so familiar 🙂 … although I come up with most my ideas when I am sitting in a lecture, or while writing boring reports. it’s all the same. whatever works! OMG, so much of our processes are the same. The running– I get great ideas while running. Only problem is that I sometimes forget them or they don’t seem so awesome when I am no longer huffing and puffing for air. Love the pic! it’s true. often, once the sweat dries or the steam evaporates, so does the brilliance. sigh. Sounds so much like me. I get most of my ideas while exercising or in the shower. I have several notebooks I keep around so I can jot the stuff down. Then eventually when I get a moment, I’ll write up a first draft. Then edit, edit, edit. 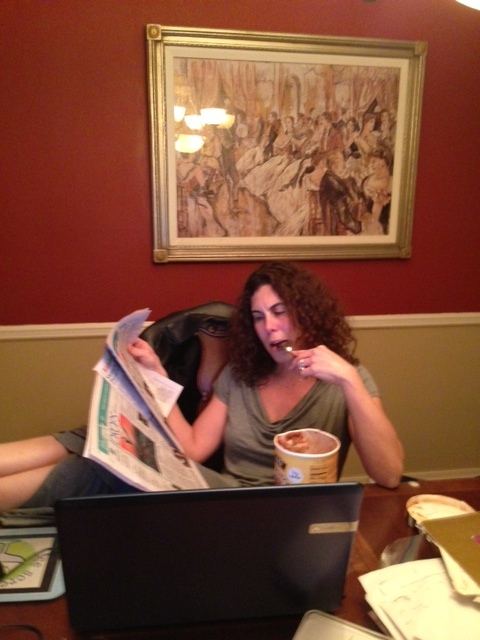 So elegant , in tour trendy living room , (I suppose so) with your super ice-cream…. No matter the topic , I adore how you write! Running sounds like a great time for brainstorming! I can’t believe I’ve never thought about it. But when I run I usually have my ipod or something. Is music conducive to helping you brainstorm, or do you just find it distracting? it really is great. i used to run with music but i stopped and now let my brain be my music. although, i have to say, when i did run with music, i was able to tune it out. but i guess ultimately i was ‘clearer’ without it. I get some of my best writing ideas while running too. I even stopped listening to music while I run just to let my mind go. me too!! no more music!! just me and my frightening brain. Okay I know this is about how you write your essays, and I’m with you on this, I “write” when I’m out walking. But seriously, peanut butter yoghurt – no way. Crikey, you’re kidding me, right? what?? they don’t have that over there?? it’s frozen yogurt. i usually mix it with coffee yogurt and add a lot of sprinkles. it’s a happy place. No way…okay, we’ll Janet does the shopping so maybe…isn’t peanut (paste) butter to have on toast? okay, i’m going to look paste that you just called my fabulous peanut butter – paste. haha! but no. i mean, yes – peanut butter goes on toast – or you just eat it with a spoon if you’re like me. but peanut butter frozen yogurt is generally found in yogurt shops, which are similar to ice cream shops. they soft serve them into a cone or cup and you add toppings, just like ice cream. done right, it’s delish!! Phew, actually, not to labour the point too much. But where Janet and I grew up the butter marketing board wouldn’t allow them to call it peanut butter, so it was called peanut paste…old habits die hard! okay – then you can call it paste. you get a pass! i wonder if they’d make vegemite yogurt! ha! I’m feelin’ this! I like to make notes on my cell phone when something brilliant comes to me. When its time to write, I also have FB, Twitter, Pinterst open and I go back and forth. Haha! That is exactly how I write essays too! By what everyone has said, i’m beginning to think it’s normal! Yup, this pretty much sums it up for most of us! I’d love to write more, but I’m afraid Twitter and Facebook aren’t gonna check themselves! exactly. that would just be irresponsible! Oh, man. I’m all too familiar with this scenario. I love Twitter and FB, but they really get in the way of my writing. They’re like frenemies. I work on my writing before checking them — oh, and e-mail, too — but I’m not always successful. I read recently that it’s best to completely bang out a complete story/essay, and then go back to revise. The hardest part is self-editing. It’s funny about the running. I think when we are exercising our brain is relaxing too and then that’s when our creativity becomes unfettered. My doctor (an internist) is a brilliant woman, kind of like a medicine woman. She’s also a big runner. She’s told me that many times with cases that are bothering her — she will be out running and the answer will pop into her head. And I echo the comment above about FB and Twitter. I love them, but need to be more structured with my time on them. Keep writing as best you can. You make me laugh, Ice Scream. This is so good and such a familiar process. Not sure why as I’m one of those people who just bang it out and hope for the best. Then I sit down to write and the bang high is lost. When I come up for air 17 hours later with some semblance of a post I like, I let my husband read it and he says, “meh,” let’s bang. Never ending cycle. Fantastic post! ha! something about exercise does clear my head for thinking, so that i can be totally distracted yet focused when i actually write.